Have you ever wondered when you should transition your child from a sippy cup to a regular cup? Do you dread the thought of spilled milk all over your house? Parents celebrate their success when they wean their child off bottles, but often get stuck in sippy cup mode for far longer than is healthy. Sippy cups are super convenient and were a marvelous invention to help minimize messes, but they can create habits that are difficult to break when you’re ready to transition to a regular cup. Here’s why you might want to transition sooner than you think, and how to make the leap when you’re ready to ditch the sippy. When Should I Start Sippy Cup Weaning? Why Should I Wean My Child off the Sippy Cup? How Can I Limit Messes? Sippy cups are designed for short-term transitional use, but culturally, we’ve bought into the idea that sippy cups are the best way to keep kids from making messes all through childhood. Think about it — how many restaurants automatically bring out a cup with a lid as soon as a child of any age sits down? In actuality, the American Academy of Pediatrics recommends children be weaned from the sippy cup by age 2 (source). But in the real world, we know that can get a bit hairy. Though 2-year-olds may be able to drink effectively from a regular cup, they are likely to still spill regularly. 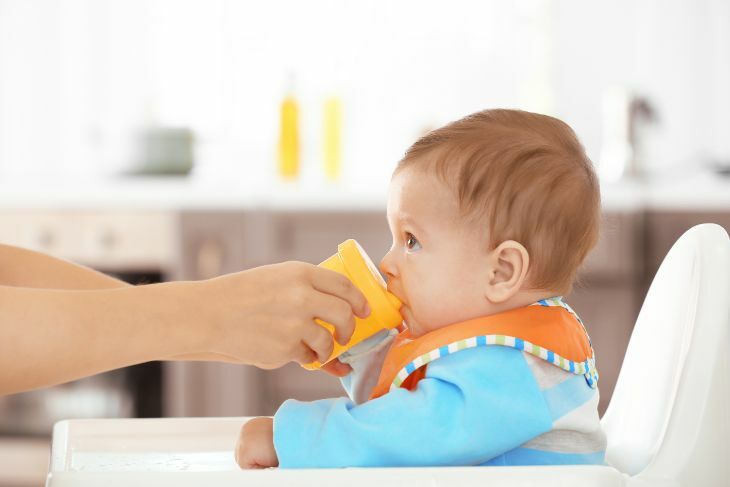 We recommend weaning as much as you can by age 2, and using the sippy cup sparingly after that only in situations where it’s absolutely necessary. Try to wean completely by age 3. Illness due to mold or mildew growth inside the spout or valve. Mouth injury from falling while using a sippy (source). Damage to developing permanent teeth. Improper development of the airway. Change in facial appearance (source). Unhealthy relationship with food, developing “comfort feeding” habits. While the idea of quitting the sippy cup is great, the fact remains toddlers are not the most coordinated of creatures and accidents are a given. If you’re not ready to give up the sippy completely, there are some other products you can use instead until your little one is a little less accident prone. Water Bottle: If you’re concerned your child isn’t drinking enough or is getting thirsty, developing a water bottle habit can be healthy — especially for later in life. Choose a water bottle they’ll love to use, but don’t let your child walk around with it constantly, lest they fall and suffer a mouth injury. Rimless Cup: A rimless cup doesn’t have a spout, which is the main cause of health and oral issues. It can also help teach your child proper form for drinking from a real cup. Straw: A straw sitting in an open cup is easily tipped, but many straw-type sippy cups are so leak-proof that they never teach your child how to be careful so they don’t spill. A simple lid and straw could be a good compromise. They don’t pose the tipping risk created by a regular straw, but aren’t so spill resistant that your child doesn’t have to learn how to exercise proper care while drinking from a cup. While you can certainly expect accidents as your child becomes accustomed to a regular cup, there are some ways you can minimize the mess. Limit cup use to the kitchen: Your kitchen has solid floors for a reason — because that’s where messes happen. Don’t allow your child to bring their cup out of the kitchen or dining area, where you can clean accidents much more easily than if they spill on your carpet or couch. Fill the cup with water: During the learning period when spills are expected, it’s way easier to wipe up a puddle of water than mop up a sticky juice spill. Use a splash mat: A splash mat goes on the floor underneath your child’s high chair to catch messes and protect your floor. Invest in a large, waterproof, machine washable splash mat to help reduce your need to mop after every meal. 1. Use a Rimless Sippy Cup. If you want to wean your child off of the traditional spouted cup but don’t have the nerves to deal with the imminent spills, use a rimless cup as a transitional tool. It will help them get the hang of the tipping motion, as well as the placement and form of their mouth on the rim. 2. Only Put a Small Amount of Liquid in Their Cup. It makes sense that the less milk there is in a cup, the less you’ll have to clean up off your floor. While your child is still learning how to drink from a cup properly, limit the liquid to one or two inches in the bottom of the cup and refill as necessary. As they develop their skills, you can start to add a little more liquid, and soon enough they’ll be drinking from a cup like a pro. 3. Hold the Cup for Them. Swallowing and drinking without allowing liquid to leak out of the mouth. Spatial development to determine how much liquid is in the cup. Motor control to tip the cup. Cognitive development to determine how much to tip the cup to drink without spilling. That’s a lot to learn all at once. Help your child in the beginning by holding and tipping the cup to their mouth for them, which will help them develop the proper oral skills to drink successfully from a cup first. They can learn the tipping motion on their own after you’ve given them pointers. 4. Get Them Their Own Water Bottle. If your child is accustomed to having a sippy cup all day, swap it with a water bottle to give them something to quench their thirst as needed — and never fill it with anything other than water. Don’t let them walk around with it as a comfort item, as they could fall and injure themselves if their mouth hits the spout on the way down. 5. Limit Milk and Juice to Meal and Snack Times Only. Your child’s attraction to the sippy is likely to dwindle if it’s not full of good-tasting stuff. You can start to transition your child off the sippy by only offering it filled with milk or juice during meal times, and filling it with water during the rest of the time. 6. Set a Firm Date to Get Rid of the Sippy Cups and Prepare Your Child. If you’re parenting an older toddler or preschooler who hasn’t yet broken the sippy cup habit, enlist them in the process. Set a firm date for ditching the sippy and remind them of it often, so they’re prepared for what’s about to happen. Sometimes it’s just easiest to rip off the band-aid — for both you and your kiddo. When sippy cups are available for use, it’s so easy to default to them. If you’re ready to drop the sippy and your child has developed the skills to use a traditional cup, just take them off the table — literally and figuratively. Ditching the sippy cup is typically more difficult for parents than for kids, mostly because of the convenience factor. It’s usually not nearly as drama-filled as dropping the bottle can be, but it has the potential to be a whole lot messier. Using a rimless cup for transitioning. Placing only a small amount of liquid in the cup at a time. Holding the cup yourself as your child builds skills. Using a water bottle for hydration throughout the day. Limiting milk and juice to meal and snack times. Setting a firm “ditch the cup” date. Do you have any tips for transitioning a child from a sippy cup to a regular cup? Share them in the comments below, and pass this along to a mama in your life who needs to know.